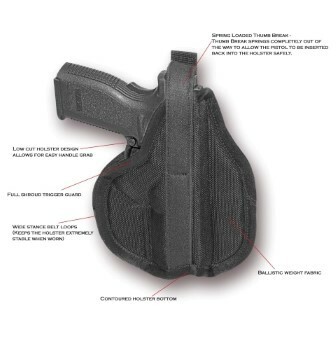 Home > Firearm Accessories > The Panther - Semi-Automatic Pistol Holster Sub-Compact 2"-2.5 "
The Panther is designed specifically for the Springfield XD series pistols. The Panther takes advantage of our popular 3D technology and our NEW Spring-loaded Thumb Break system to retain the firearm. This holster also accommodates a larger trigger guard.